Rugby players come in all shapes and sizes – and a University of Stirling study is helping the Scotland under-20 side discover their own perfect proportions. 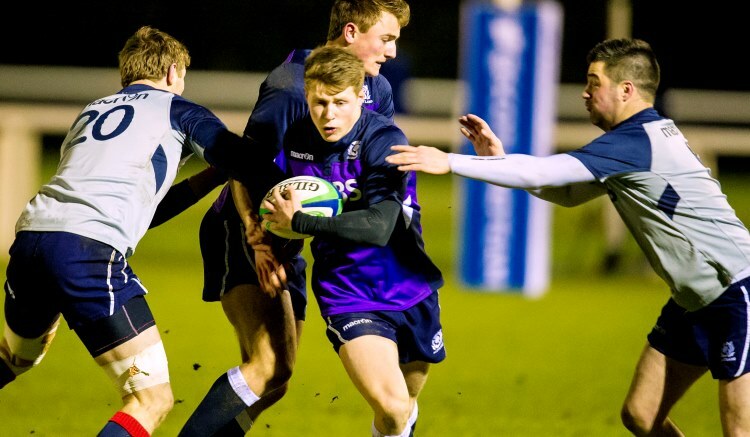 Scotland under-20 kick-off their 6 Nations Championship campaign in France this weekend, their matches running concurrently with the senior side. Whilst Head Coach Sean Lineen will be poring over their playing performance, Stirling sport and health research scientists are assessing their height, body mass, body composition and even what they eat. “Typically, rugby players should have a high lean and low fat mass, which they can achieve through their training and diet,” said PhD student Lindsay Macnaughton, who is leading the project. Pre-tournament measurements of the squad have already been recorded through a combination of traditional methods and state-of-the-art technology. Skinfold thickness was measured using callipers whilst each athletes’ fat and muscle masses were determined using a Dual-Energy X-ray Absorptiometry (DEXA) scanner to produce a full body composition readout. Food diaries will monitor what the players eat and drink and a repeat of the entire process in March, following the final fixture against Ireland, will feed into a detailed report for the players and national nutritionists to consider the results. Macnaughton added: “It’s an exciting project to be working with the Scotland stars of the future. They are still developing physically and so hopefully we can help them make the small adjustments which can improve their performance levels. “Some of the younger guys will be trying to increase their muscle mass, whilst others are looking to maintain their size or maybe even lose some weight. It’s not a case of one size fits all as different positions require different body shapes. Richard Chessor, Lead Nutritionist at Scottish Rugby, said: “We are really excited to be involved in this project with the University of Stirling Health and Exercise Research Group. It will provide valuable data to help us better understand our players’ physiology and how it changes over the course of our season. The study is also comparing what happens at elite level with University and Club level players, an area of specific interest to Macnaughton, from Orkney, given her role as captain of the University Ladies’ Rugby team and winger for local side Stirling County Ladies. This builds on previous research at Scotland’s University for Sporting Excellence which studied the sweat patterns of the senior Scotland men’s team to assist nutritionists in developing tailored hydration plans for each player.